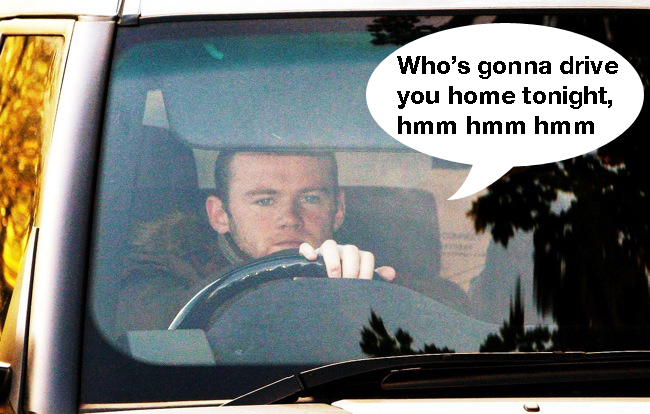 A pensive Wazza drives away from Man Utd’s Carrington training ground in his big, eco-friendly car. What song do you think he was listening to, people? Or perhaps he was listening to a self-help tape: How To Stand Up To Your Boss. Surely ‘Five Years’ by Bowie? Noow we are aaarrree happy! Am happy with Alex,happy with Wayne. He’s OBVIOUSLY listening to Elvis Costello’s “(I Don’t Want To Go To) Chelsea”.